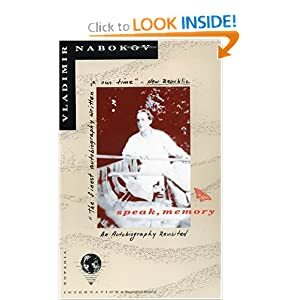 “Speak Memory” by Vladimir Nabokov is perhaps the most elegant memoir ever written. It is my favourite memoir, and one of my favourite books.Nabokov’s prose is so beautiful that all one can do is sigh. Nabokov wrote his book in English, of course, but he was trilingual (Russian, French and English) from an early age, and his English has the sort of contorted, pretzel-like strangeness one frequently finds in the (perfectly correct) English prose of the bi-lingual–I think of the prose of Sara Suleri and Salman Rushdie and Arundhati Roy. Nabokov describes, as one of his chapter titles puts it, a “Past Perfect,” a happy Russian boyhood, with books, and governesses, and wealth, and adoration, and time to pursue his many interests–butterflies, chess, books. He was brilliant, and more importantly, blessed with a relatively easy-going temperament that enabled him to take the massive reverses of the Russian Revolution in his stride without bitterness, but with a philosophic, even amused, equanimity. That same essential stability of temperament enabled a happy and nourishing marriage amid all the vicissitudes of the emigre’s life. A wonderful portrait of a vanished world! Full of sunlight and butterfly filled fields, and books and love! Thanks Meghan. How lovely to find someone else who cares for “Speak Memory”! It wasn't an easy temperament that allowed him to find happiness despite the Russian Revolution, but a belief in absolute truth.